From 31 October – 21 November, and again from 14-19 December 1972 GOLDSBOROUGH conducted “LINEBACKER” operations as part of Task Unit 77.1.1. From her holding station in the Hon La Surveillance Area, the ship made nightly Naval Gunfire Strikes on North Vietnam, averaging two or three strikes per night. On the night of 19 December the ship was struck by an enemy shell. The explosion holed the 01 Level Aft between mount 52 and the Tartar Check-Out Compartment. Fires started on the 01 Level and in the After Chief’s Quarters, directly below, were quickly extinguished; however shrapnel and shell fragments killed two men and wounded six. The two dead were HTC Donald A. DIX, USN and BM1 Robert M. DOW, USN. HT2 Gary L. BOYCE, USNR, later died as a result of his wounds at the Air Force Hospital, Clark AFB, Republic of the Philippines. 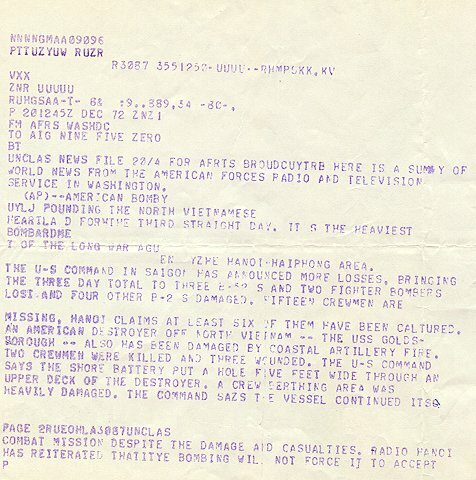 Damage to the ship was judged light, and after picking up materials in Da Nang, Republic of Vietnam, temporary repairs were made onboard, and the ship continued NGSF Missions in Military Region I. On 24 December GOLDSBOROUGH departed Vietnam for Sasebo, Japan, for repair of battle damage, arriving on 28 December. The ship remained at the Repair Facility in Sasebo through the beginning of the New Year.